Ezra mourns for the Jews' conduct. (1-4) Ezra's confession of sins. (5-15)1-4 Many corruptions lurk out of the view of the most careful rulers. Some of the people disobeyed the express command of God, which forbade all marriages with the heathen, #De 7|. Disbelief of God's all-sufficiency, is at the bottom of the sorry shifts we make to help ourselves. They exposed themselves and their children to the peril of idolatry, that had ruined their church and nation. Carnal professors may make light of such connexions, and try to explain away the exhortations to be separate; but those who are best acquainted with the word of God, will treat the subject in another manner. They must forebode the worst from such unions. The evils excused, and even pleaded for; by many professors, astonish and cause regret in the true believer. All who profess to be God's people, ought to strengthen those that appear and act against vice and profaneness. 5-15 The sacrifice, especially the evening sacrifice, was a type of the blessed Lamb of God, who in the evening of the world, was to take away sin by the sacrifice of himself. 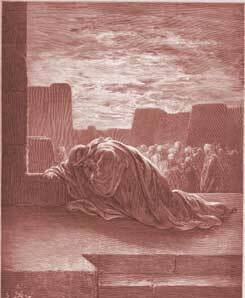 Ezra's address is a penitent confession of sin, the sin of his people. But let this be the comfort of true penitents, that though their sins reach to the heavens, God's mercy is in the heavens. Ezra, speaking of sin, speaks as one much ashamed. Holy shame is as necessary in true repentance as holy sorrow. Ezra speaks as much amazed. The discoveries of guilt cause amazement; the more we think of sin, the worse it looks. Say, God be merciful to me sinner. Ezra speaks as one much afraid. There is not a surer or saddler presage of ruin, than turning to sin, after great judgments, and great deliverances. Every one in the church of God, has to wonder that he has not wearied out the Lord's patience, and brought destruction upon himself. What then must be the case of the ungodly? But though the true penitent has nothing to plead in his own behalf, the heavenly Advocate pleads most powerfully for him. Thanks Nharna, I think sins pollution deafens our spirit, making giving and getting direction harder and harder. God wants us to hear him and believe, not struggle with every thing written in the word. Verse 5~Ezra was in great distress and he poured out his heart in prayer to Jehovah God. When we are in great distress we want to pour out our heart in prayer to God as well. Actually, this passage show us that through it all God delivered Israel against insurmountable odds. And even after that, the childern of Israel still pursued things that they were NOT supposed to touch. After hearing of this travesty, Ezra realized that it was wrong and questioned the acts on a moral and ethical basis. "Oh God how can we stand before you? " Look at our shameful acts. He could have easily taken our lives before and even now. But yet He still blesses us. It makes one think about our loyalty to God through His son Jesus Christ. I am guilty of such from time to time going after the wrong things when God has clearly blessed and delivered me. This chapter reviews the fact that sin prevents us from having the actual view of God. As ezra ended the chapter saying " for we cannot stand before thee because of this " because He God is righteous and anyone who yearns to fellowship with Him must be as He Is. When we pray for forgiveness and humble ourselves I believe God is a merciful God who will forgive sin. If we pray to god sincerely no matter what our sin he will forgive us. he is a god of love although he can move with wrath. He was praying to God for forgiveness for the people of Israel because they had gone against the commandments of God by taking wives from the daughters of the nations that God commanded NOT to take wives and husbands from among them. As a servant of God he knew how devastating the wrath of God could be when it is unleashed on people, because of their act of iniquity. What Do You Think of Ezra 9?